Why the name 'Caddy Supply Co'? Meet our original founders. As of spring 2016, Caddy Supply Company is the new name of R.E. Caddy & Company Inc.
R.E. Caddy & Company Inc was originally founded in 1958 by Richard Earl "Tip" Caddy Sr. For over 50 years, The business has supplied craft and processed broom corn, palmyra and yucca fiber; wood broom, brush and mop handles; wet mop hardware and handles; polyethylene broom sewing twine; nails, knives and other supplies. Richard Earl "Tip" Caddy Senior was born in Cincinnati, Ohio in 1916 and passed in 2004. He was a member of Holy Trinity Episcopal Church, where he was a vestryman and junior and senior warden. Mr. Caddy graduated from the University of Cincinnati. Mr. Caddy served in WW II in the Army Air Corps. He was former board man and president of American Brush and Broom Manufacturers. 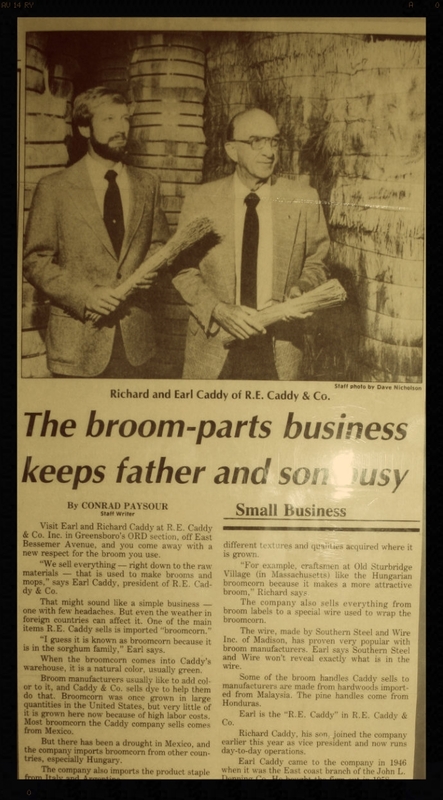 Richard Caddy has an impressive 33 years in broomcorn business. He joined RE Caddy & Co, Inc as Vice President in 1983 and became President in 1985. He created the special craft broom maker program in 1994 and launched an online store in 2003. He has a BA from UNC, 1971 and MPA from UNC, 1974. When it comes to customer service, Caddy explained, R.E. Caddy has emphasized communicating with customers to remain current on their operations and their needs.